The first Blue Planet Odyssey yachts arrive in Montego Bay, Jamaica today, after a relatively fast passage from Key West on 10th January. Passing Cayman Brac Island 2nm off its eastern tip…… sharks have been following us. We had a huge pack, maybe 15, dolphins swimming in between our bows. We are headed right for Little Cayman so maybe a swim call, will have to see how close we get. Water temp where we are right now is 83. Did you see we had jumped into first place over night? 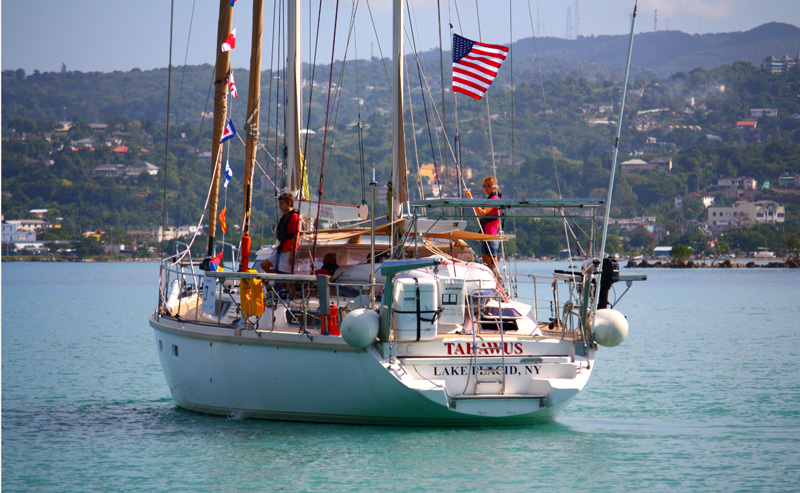 S/V Tahawus wouldn’t motor and was only sailing at 1 kt, we motored all night. His crew had a mutiny and he had to motor. Once we all started sailing he smoked us. We are in stealth motor mode for the night and plan to jump him again. After a 11.30 departure from Key West on 1/10 we headed across the Gulf Stream and now are gybeing down the Coast of Cuba on are way to Jamaica. Crossing was a little rollie but crew is all fine. 309 miles to Jamaica and nice winds, we finally started the engine last night when the boys questioned how many days 4000 hrs was on the TTG. Seas have been nice and crew is happy. 115 Miles to go to Jamaica, not much wind, motoring, could be worse, could be freezing our butts off in LP. The yachts can expect a warm welcome from the Montego Bay Yacht Club.